Written by Shannon Miller, Esq. Reviewed by Kellen Bryant, Esq. Estate planning and advance directives can be difficult topics for our aging parents. Eileen’s story will outline how to get the conversation started. Eileen contacted me to discuss concerns about her aging parent’s estate plan. She had no idea what her parent’s assets were, how the assets were titled, or if they even had an estate plan, power of attorney, or advance directives. She wasn’t sure if her parents had $100,000 or $10 million because they were very private about their assets investments and information. Secrecy about finances and estate plans is common in many of my older clients and can be quite disconcerting for children who feel anxious about whether plans have been made effectively. I cannot emphasize how many times I see poor estate plans that do not work. That is one of the reasons our litigation practice is ever increasing. Eileen expressed a heightened level of anxiety since her mom had recently passed away and her father was exhibiting declined mental status. She had the foresight to know that it would be much easier for her and less stressful for her dad if she could help him plan for some of these end of life issues before dementia compromised the completion of the process. We sat down to talk about how to approach her dad regarding these issues and developed the following five strategies for getting her father to open up and to assist him with his planning without invading his privacy or influencing him unduly. 1. Create your own estate plan and share it with your dad. This will allow your father to understand the importance of planning for your family and how family members can benefit from knowing where Important financial information and instructions are located in case of emergencies or your death or disability. Remember, your dad may struggle with making this information known to you, a common behavior in his generation, and your actions may reduce any fear he is experiencing. Furthermore, many elderly clients think that he will create his estate plan “when I need it” or that he will lose control over finances when a durable power of attorney is signed. Showing that you have done your own estate planning will help dispel these myths and also put you on alert that your dad has these misconceptions, which are keeping him from doing something. You can explain that “when I need it” is too late and there could be costly court guardianship proceedings. You can explain that the durable power of attorney does not take away rights to manage finances, you are merely assigning a “co-pilot” if help is needed. You should also share with him your wishes for your end of life decision making as well as what should happen if you are unable to make decisions for yourself. This strategy can often prompt reciprocity. 2. Set a date and time to discuss your father’s plans for end of life decision making, incapacity, and death. This will help you express a willingness to be responsible for assisting your father with his affairs. Be sure to include siblings or other family decision makers in this planned meeting and invite your father to set the agenda and to determine who attends the meeting. Maintaining control over his decisions is important to your dad. 3. Create an estate planning notebook that includes information related to planning documents, important people to contact upon death, instructions about burial and funeral location and details of service, financial advisors and planners, CPAs, information regarding assets with financial institution; asset information could be used to compromise your financial status so keep your notebook in a safe secure place. Show it to your father and suggest creating a similar notebook for him to use. His generation tends to appreciate and admire a high degree of preparation and organization. Help him set it up if he is willing because a task like this may seem difficult for him at his age. •	Would you want your life prolonged if you could not breathe on your own and were unable to communicate? •	If you were in a persistent vegetative state (no brain activity), would you want artificial hydration and nutrition withdrawn so you could die a natural death? If your father is not responsive this positive approach, you can also bring up his late friends and family in conversation, and whether or not he heard stories of things going well. If things went smoothly with his best friend’s death, was it because of good planning? If he and his siblings fought when their mother died, was it because of poor planning? Explain that he needs to take charge so that things go smoothly after he passes or if he becomes incapacitated. 5. Be direct. Express your and your siblings’ fears related to being unaware of your father’s plans and finances and fear of being unable to manage your father’s affairs the way he wants upon incapacity or death. Finances cannot be managed when you don’t know where assets are or how he wants them managed. While you respect his privacy, let him know his wishes will be followed in any situation that arises. Be clear that the conversation is not about receiving an inheritance or personal windfall, but instead it is about a conversation about giving direction so that conflict does not arise after he passes. Involving other family helps dispel his potential suspicion that you are trying to take his money. 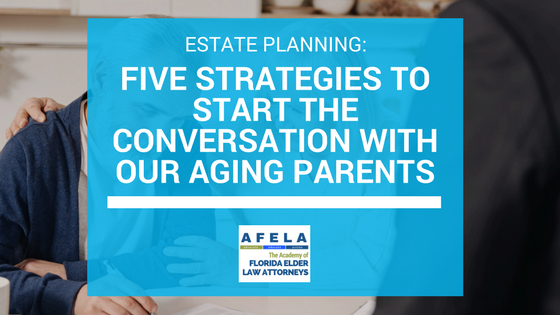 If after using these strategies your father is unwilling to complete an estate plan or share one with financial information, respect his decision and continue to support him. It is often the case that loved ones facing incapacity change their minds. Be patient.